Looking forward to playing games in ultra-crisp 4K resolution on the Xbox One X? 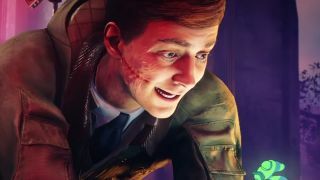 Add two more titles to your "games that will look prettier on Microsoft's new console" list: Wolfenstein 2: The New Colossus and The Evil Within 2. The news was revealed via a simple update to the games' official pages on the Xbox website. Both games are now listed as supporting 4K resolution, HDR color processing, and are "Xbox One X enhanced". Unfortunately, there's no explanation just yet as to what all that actually means. Is the 4K resolution native or achieved via checkerboard rendering, dynamic scaling, or other rendering techniques? Will the games have better lighting or particles on Xbox One X vs the base system like Gears of War 4? We've reached out to Bethesda to learn more. In the meantime, for those of you pondering the possibility of an Xbox One X purchase, take comfort knowing that when it comes to consoles, two good-looking games are gonna look even gooder on it. Want to prepare for these two games? Read our Wolfenstein 2 preview and check your local comic store for the Evil Within 2 comic book tie-in.